Earn 5.4 SB per $ when you buy Burlington gift cards at MyGiftCardsPlus, powered by Swagbucks. Burlington has something for everyone, offering current, high-quality, designer and name-brand merchandise at up to 65% off department store prices every day. Burlington is a convenient one-stop shopping experience for the entire family. Choose from a great assortment of ladies', mens', and children's clothing, family footwear, furniture and accessories for baby at Baby Depot, home decor and gifts, and of course, the largest selection of coats in the nation. 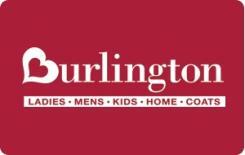 Burlington Coat Factory gift cards can be used to redeem for merchandise and services at Burlington Coat Factory, Baby Depot stores and www.BurlingtonCoatFactory.com.